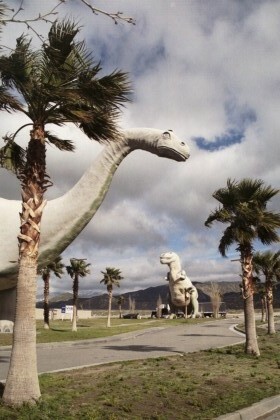 Claude Bell’s dinosaurs are icons of roadside America - some people may remember them from Pee Wee’s Big Adventure, while others have grown up with them along the highway in southern California. The most amazing thing about these dinos are the attention to detail. The builder wanted to be as accurate as possible, while creating an exciting environment for children to explore. The belly of the first one, the brontosaurus, was originally designed to be a natural history museum of and about dinosaurs. Dinney's creator is Mr. Claude K. Bell. Mr. Bell has invested 11 years of his life and over a quarter of a million dollars in Dinney. He designed and built Dinney without the help of a construction company or investors. Nestled in Dinney's heart is a small gift shop and museum, which is open to the public at an admission charge of .50 cents for adults and .25 cents for children. Children under 10 are admitted free! It is interesting to note that at this rate it would take 32 years to pay for Dinney, and this does not include paying the bills for operating him. As Mr. Bell is 80 years old, he has no thoughts of ever regaining his investment. 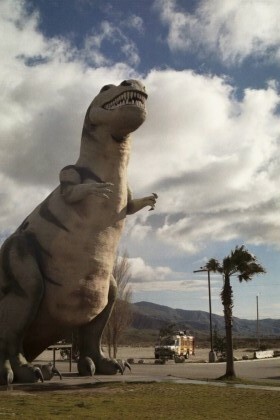 INSTEAD --- he plans on constructing a towering Tyranasaurous Rex with a slide down his back! This should be complete in about 5 years, as Mr. Bell has already solved many of the structural problems encountered in building a Dinosaur. Thank you for this visit, and we hope you enjoy and appreciate the work that Mr. Bell has put into this creation for you. In an early interview, Mr. Bell said "When I was a kid, my uncle took me to see the big elephant house at the boardwalk in Atlantic City. that did it. from then on I decided someday I would build something big like that elephant house." He then worked for Knott's Berry Farm, making very large things for the park. He took that knowledge and put it to use along Interstate 10. Dinney: 45 ft. high, 150 ft. long, welded steel armature and cement (castoffs from the freeway after a flash flood buried some of the materials andstate engineering practices prohibit reuse), girders from a defunct drive-in theater. And 1,200 bagfuls of cement. Rex: 65 ft. high, similar construction as Dinney. It's rumored that bathrooms had to be added for the production of Pee Wee's Big Adventure. Begun 1981, ended approximately 1986.